If you are starting to see brown leaves on your hostas, you are not alone. It's nothing to worry about, it's just what I like to call the Hosta Uglies. Hostas on are the decline, as they prepare themselves for dormancy. I heard on the news that our first frost could come as early as this week Thursday. 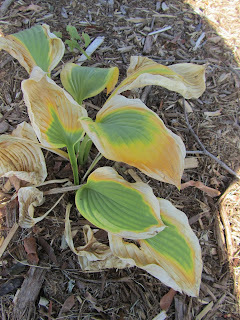 Even though the hostas do not look their best does not mean you should just forget about them. If the weather has been dry for several days, you should still be watering them like you would when they are in their prime. This is the time of year that a lot of people ask me if they can bring some of their hostas inside for the winter The answer is no, hostas actually require a dormancy period in order to survive. So if your hostas look like the ones below, don't worry they are not diseased or dying....they just have the Hosta Uglies. I have tons of hostas so you'd think I'd already know the answer to this question....but I don't. Can I cut the really ugly ones down to the ground now? Frost this week...no way! My moonflower vines have big fat buds but haven't bloomed yet. I would recommend cutting them down to the ground yet. It's better to do it when all of the leaves are dead. Otherwise if one of the hostas happens to have a disease you don't spread it to all of the others when cutting them down. Unless you really hate how ugly they get, then you can dip your cutting tool in a 10% bleach solution between hostas. Oops, I meant to say I wouldn't recommend cutting them to the ground.